Happy Anniversary to me! 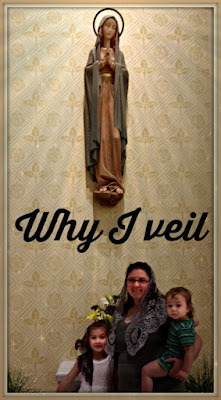 It has been one year since I have decided to veil whenever I go to Mass or Adoration. Although I had been dabbling in the practice for a few years, it was at my birthday last year when I decided to do it full time. Despite my early insecurities, I have noticed a growth in my spiritual journey. I stopped holding back. I said “yes.” I grew. To mark my veil-iversary I wanted to explain why I veil and how it has affected me. 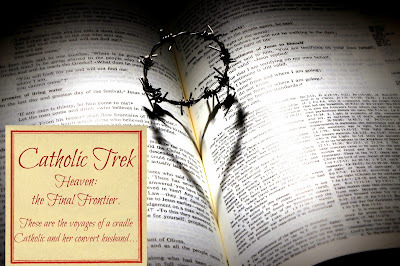 Veiling is a beautiful symbol that has been in the Catholic church for over 2000 years. Not only is it a loving submission to God, but it is also a public proclamation of reverence to the True Presence in the church. Jesus is physically present! While God resides everywhere at all times in a spiritual manner, He is present in a substantial way not found anywhere else on earth in the Blessed Sacrament, which is the true, living, Body and Blood, soul and divinity of our Lord, Jesus Christ. Honoring Him in this symbolic manner lets me mimic many saints that have covered their heads over the past few millenia. Women are dignified by veiling. In this age it is important for Catholic women to be counter-cultural and uphold true femininity. While the culture of our age pulls us away from God, a veil can help focus us in prayer and worship. This act of humility is an expression of reverence and love. Just as the tabernacle is veiled because it holds the Bread of Life, women veil because we can receive life, both human and supernatural. Because a woman represents the Church the veil is a visible reminder of the invisible reality of the nuptial love between Christ and His Bride, the Church. Who veils? Brides, religious, and first communicants veil because they are the brides of Christ. It is right to continue to veil, not just at those times, but every time we are in His true presence. Mary has been called the new ark of the covenant. Within her womb she held Jesus. She has always been depicted and appears with a head covering. What is better than following in Mary's footsteps? Since Mary defines dignity, femininity, modesty, and humility, we are right in emulating her example. 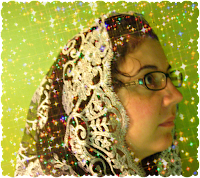 Deciding to veil was not an easy decision for me. It took me a little over a year to work up the courage to do it. Even though I knew God was urging me to do it I was scared. Now that I look back on this past year, I am so thankful to have listened and obeyed. If you feel the urge to veil, don't hold back! It has turned up the heat in my heart and has changed how I see the Mass. I hope that you understand why I veil and if you want to join me; don't be afraid!